Lancaster, England, 28th April 2014: ROK Comics is pleased to announce the arrival of the ROK Comics Ultra marketplace app on Apple’s iTunes store. The new app brings all ROK Comics amazing audio comics titles under one roof, including Team M.O.B.I.L.E. and The Beatles Story. The app also features “Comics Communique”, a comics news service and a number of comic titles published in partnership with other publishers, with more to come in the next few months. 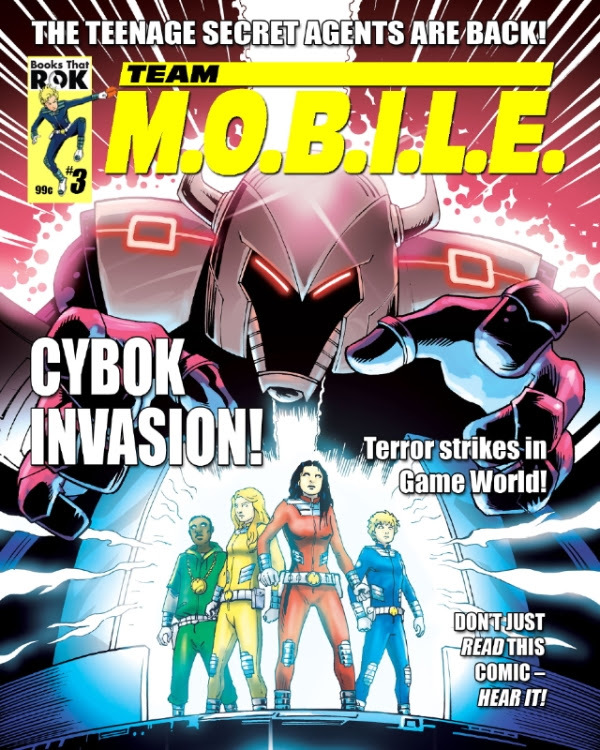 An issue of the audio comic, Team M.O.B.I.L.E., available on the ROK Comics Ultra platform. Cover art bt Andrew Chiu. 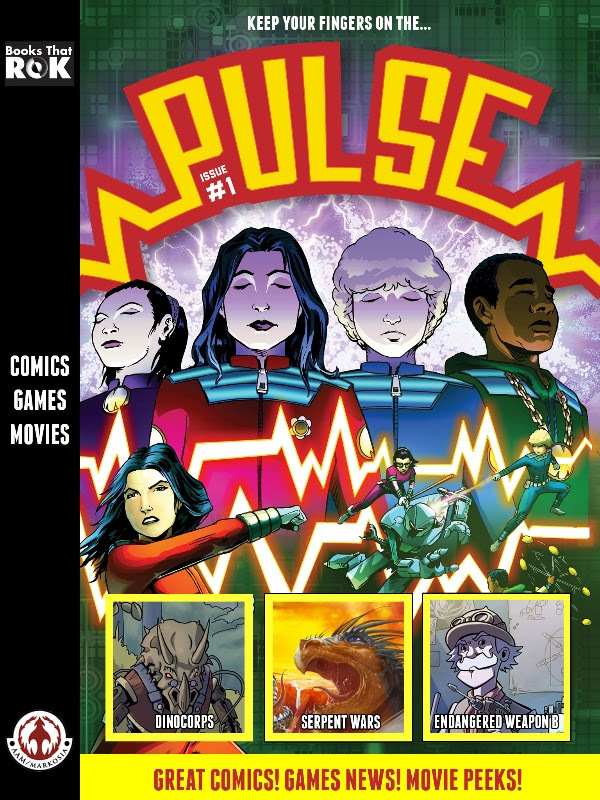 ROK Comics new digital anthology,PULSE, published in partnership with Markosia. Exclusive to the platform is a new ongoing digital comics anthology, PULSE for iPad users, published in partnership with Markosia Enterprises. The title, aimed at teenagers, will initially feature Team M.O.B.I.L.E., Dinocorps, Serpent Wars and Endangered Weapon B. An ongoing adventure created by Jonathan Kendrick, Team M.O.B.I.L.E. centres on the story of teenagers recruited into a secret organisation to battle crime, terrorism and other dangers – some stranger than others. Entombed for millennia, a team of combat dinosaurs – Dinocorps (written by Andy Briggs & Steve Horvath, with art from Robert Molesworth) – are accidentally reanimated by 14-year-old Carl Heyward. While trying to keep them a secret, Carl discovers the evil Saurons have survived too. Responsible for the last mass extinction event, they’re planning to eradicate the human mammalian vermin with another extinction event. The race is on to save the planet… again. World shaking action-adventure in this all-ages story! Serpent Wars (written by Christian Rodriguez & Chris Campanozzi, with art from Antonio Rojo) is set in the mid-1800’s where a young scientist smuggles himself aboard the war ship of a British Lord bound for South America only to discover a land filled with serpent gods destined to rule mankind. With the aid of a spiritual goddess the brave adventurer must battle to free the island and humanity from the tyranny of these giant creatures. What kind of lunatic forces a grizzly bear to wear mechanized combat armour and fight his battles? What kind of fiend kidnaps a beautiful Polynesian computer genius to be his child bride? And just who has a ninja for a butler anyway? Meet the Professor: eccentric, scientist, explorer and Englishman par excellence. There’s madcap steampunk hi-jinks aplenty in Endangered Weapon B, written by David Tallerman, with art from Bob Molesworth). Uber & Absolution: Rubicon Digital Comics From Avatar Press This Week!